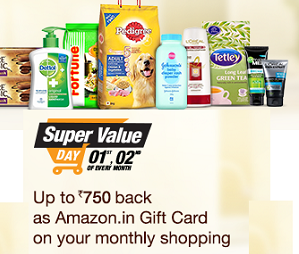 All the shopaholics have a chance to hook an amazing deal at Amazon Super Value Day. Get gift card vouchers for up to Rs.750. Offer is valid for a period of 2 days starting from 1st December 2015 (12:00 AM) to 2nd December 2015 (11:59 PM). Shop For Rs.3000 and get Rs.750 worth Gift Card. Shop for Rs.1000 , Rs.2000 , Rs.3000 and earn gift vouchers for Rs.250, Rs.500 , Rs.750 respectively. Hurry ! Offer Period lasts for 2 days.